The hallmark recipe in Yotam Ottolenghi and Helen Goh’s new dessert cookbook Sweet: Desserts from London’s Ottolenghi is a pistachio and rose water semolina cake served with a rose cream (a tangy combination of creme fraiche and Greek yogurt). It’s a moist and aromatic cake, adorned at the end with candied rose petals and chopped pistachios. It sounds elaborate and extravagant, but is in fact, a deceptively simple cake to bake. Let’s, however momentarily, discuss the word “simple” and its meaning here, because while the cooking time might have been minimal, the procurement of raw materials was a little more tricky. The cake requires a handful of less than common ingredients. Rose water, for example, can be found at perhaps a few higher end grocery stores, but I went to a Middle Eastern bakery in a neighborhood three miles north of my local grocery store and a solid bus ride away, to locate it; cardamom pods need to be requested individually at Whole Foods, and how many times have I gone up and down the dairy aisle at the grocery store only to forget that crème fraîche is next to the sour cream? So there is some extra lifting required in the preparation, and fingers crossed you own a food processor (to ground up those pistachios), but once everything is assembled, the cake comes together with minimal effort. No whisking of egg whites or piping or flipping or anything like that. And it tastes amazing, of course. I’ve been baking fairly frequently for about two years. In that time, I’ve become adept at a handful of staples: citrus-based cakes, breakfast muffins, and requisite workplace goodies cupcakes or banana bread. But I was eager to get into Baking 202, and Sweet has been the sophomore year textbook I’ve sought. 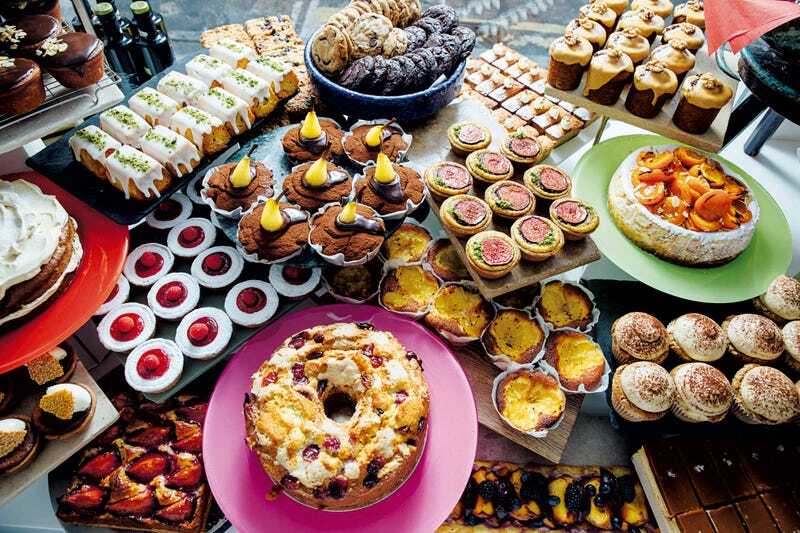 Ottolenghi, an Israeli-British chef and restaurant owner, author of much-beloved cookbooks Plenty and Jerusalem, teamed up with his “product developer” and pastry chef, Helen Goh, for this expansive dessert book with recipes ranging from cookies to tarts to galettes to layer cakes to lollipops. There are a handful of traditional favorites—variants on chocolate chip cookies, a lemon poppyseed cake, strawberry and vanilla cupcakes—but mainly Sweet is comprised of experimentations on flavors and techniques. There are pavlovas! Panna cotta! A beautiful black currant and lemon cake with stripes of icing that reveals itself to be a gigantic, vertical swiss roll. As an experienced baker, I was drawn to the more innovative flavor combinations of Sweet. Two recipes in the book, the tahini and halva brownies and baked chocolate mousse tarts with tahini, combine a rich dark chocolate with sesame, either in the form of tahini (ground sesame paste) or halva (a sesame-based, crumbly confectionary popular in the Middle East and Eastern Europe). The brownies were a dream, a rich and not-too-sweet variation on a classic, complete with small explosive pockets of halva to chew on. The tarts were one of the more labor-intensive recipes in the book—I made my first shortcrust pastry!—but the results were buttery and filling, the tahini blending effortlessly with the mousse. The combination of chocolate and tahini summons a nostalgia for chocolate and peanut butter: a balanced combination of sweet and salty. But as someone who never held a particular fondness for peanut butter (I can’t, I’m sorry, don’t hate me), tahini is a welcome alternative. It’s a subtle counterbalance to the bitter notes of the chocolate, giving both the tarts and the brownies a rounded smoothness and deep cocoa taste. Sweet even provided me a chance at redemption at my most feared dessert: cheesecake. Though an enthusiastic fan of eating them, I completely ruined one over a year ago that put me off baking them for some time. (The details of that story are unfortunately too horrifying to recount in full here, but in short I gelatinized the eggs.) Ottolenghi and Goh’s book has a whole chapter devoted to them, and I knew in reviewing this book it wouldn’t be fair to omit a full section. As a longtime lover of key lime pie, I decided to try Sweet’s lime and roasted strawberry cheesecake. Making cheesecake, not unlike the tarts, is a full-day affair. When I say that, I don’t mean 8-12 consecutive hours of baking; there is just a rhythm of combining and baking and setting and cooling that requires intermittent attention. It’s the type of recipe recommended for a rainy day. Throughout, Ottolenghi adequately held my hands through the process of putting together the cheesecake. Despite its occasional difficulty in its recipes, Sweet is adept at explaining precisely how and why each step of a recipe should happen the way it does. There is no assumption made about the level of baker using the book. Anyone with the enthusiasm to pick it up should find a recipe that meets their skill level. In a different recipe, I finally conquered my fear of swiss rolls in order to conquer a pistachio roulade with raspberries and white chocolate. Not unlike the rose cake, the ground pistachios in the batter provides a sweet, nutty base for this cake whose soft and light sponge is ideal for rolling in with a melted chocolate whipped cream. That’s not to say every recipe went off without a hitch. The lemon, blueberry, and almond teacakes—inverted muffins topped with a lemon icing—should have been a slam dunk for me, a longtime cupcake and muffin baker, but some combination of under-greasing the muffin tin and perhaps undercooling led to the teacakes practically crumbling in my hands. As frustrating as it is to admit as a creative type, baking is a science, one that requires precision and accuracy. But the strain to be more attentive hasn’t ruined the fun of it. It’s quite the opposite. But growth is not only technical. With more complicated bakes that require more time, more science, more effort than mixing wet and dry ingredients and putting them in the oven, there becomes a much greater margin for error. As an amateur baker, one who, say, accidentally cooked their eggs when making a cheesecake a year ago, I would have openly resented the time it took to me to bake something that didn’t turn out. With Sweet, I’ve learned more about the process than anything else. As I disappointedly eased the teacakes out of their molds, I mentally took notes of how to improve in the future. With every batch of egg whites folded into a batter or cake rolled into a spiral, I get better, regardless of the outcome. With every trek into a different neighborhood or a smaller grocery store, my palate and preferences expand—no longer limited to descriptors like sweet or salty or chocolatey, but cakes can be floral, icings tangy, cheesecakes topped with roasted, almost blackened, strawberries. 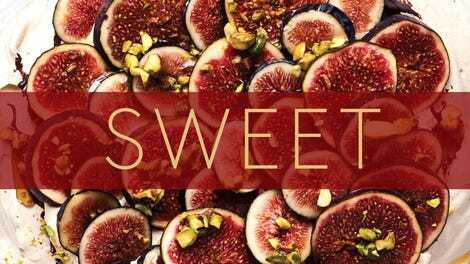 Sweet is a book compiled with care and compassion, not only written with a love of baked goods but the process with which desserts come to fruition. It’s the ideal guide for any amateur eager to roll up their sleeves a little higher and reach a little farther.